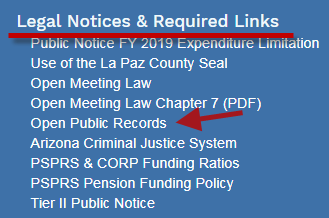 There is a more well-regarded, long-standing public record directory, if La Paz County, Arizona wants to inform its citizens of other sources of county searchable databases. Additionally, the commercial website has a search form that is potentially misleading. It suggests that the court search is of local county records, but it is actually retrieving Federal court records. 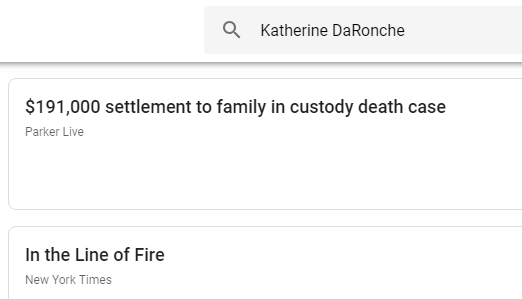 And those are for the past few years, only. PACER is the government service that provides Federal court records online, which anyone can use to search and retrieve case dockets and filings. If you just need to do a quick search, PacerMonitor returns more details in their free search. Or, search by party name at Justia to view limited case information. Then select the online links to news and other sources naming that party. 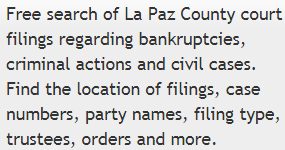 This entry was posted in Arizona, Portals & Directories, Public Records. Bookmark the permalink.